A new generator must have a valid and active interconnection request in place by the close of the SOI submission window, regardless of interconnecting jurisdiction. For details, see the following sections of the Open Access Transmission Tariff (OATT): Schedule 22, Large Generator Interconnection Procedures; Schedule 23, Small Generator Interconnection Procedures; and Schedule 25, Elective Transmission Upgrade Interconnection Procedures. Projects that don’t fall under the jurisdiction of the Federal Energy Regulatory Commission (“non-FERC jurisdictional projects”) must provide a copy of the interconnection application submitted to the local utility entity specifying the point of interconnection, substation name, and/or distribution feeder number. The specific project tracking number used by the local utility entity during the interconnection process should also be provided. The local utility entity is responsible for determining whether the resource is FERC or non-FERC jurisdictional. Generators that submitted an SOI in the last qualification cycle but withdrew, didn’t clear, or only partially cleared can reuse the information in that SOI. See the carryover instructions. Intermittent generators are wind, solar, run-of-river hydro, and other renewable resources that do not have control over their net power output. Nonintermittent generators can control their net power output. Examples include natural gas- and coal-fired resources and nuclear resources. An SOI can be submitted for a new generator that hasn’t previously cleared in an FCA. The incremental capacity is less than the greater of 20% of the existing qualified capacity or 40 MW. The investment is for compliance with environmental regulations or permits. Uprate (increase above threshold)—An existing resource can qualify as new if it is proposing an increase in output that is the greater of 20% or 40 MW above the existing qualified capacity. Reestablishment—An existing resource that has been derated for over three years can participate as new capacity with the submission of an SOI. *For the specific amount per kilowatt, see the cost threshold adjustment parameters for each FCA available on the FCM Parameters section of the FCM webpage. These thresholds are based on the Handy-Whitman Index of Public Utility Construction Costs—details below. See Market Rule 1, Sections 13.1.1.1.2 to 13.1.1.1.4 for details. The Handy-Whitman Index is derived from cost trends in public utility construction. The ISO uses the index’s data on “Total Other Production Plant” costs (construction and equipment) in the North Atlantic region. The cost-threshold adjustment formula: benchmark year costs x (variable index value ÷ base index value). These adjusted qualification thresholds for each FCA are available on the FCM Parameters section of the FCM webpage. The Handy-Whitman Index publisher, Whitman, Requardt & Associates, LLP, has granted the ISO permission to distribute data. If the supplied documentation does not list the project sponsor as the controlling entity, the sponsor must provide additional documentation with the SOI submission demonstrating the relationship between the project sponsor and controlling entity. Note: Additional information for new generation projects beyond what the FCTS requests should be provided using the “New Generation Project Form: Supplemental Information for Direct Connect Review” and uploaded as additional “Interconnection Study” documentation in the FCTS during the SOI submission process. In some cases, a new resource can reuse a previously submitted show of interest. The previous SOI was submitted in the immediately preceding capacity commitment period (CCP). SOIs from two or more prior CCPs are ineligible. The project was withdrawn by the participant before the Forward Capacity Auction (FCA), or it was qualified but either did not obtain a capacity supply obligation (CSO) or only obtained a CSO for part of its qualified capacity. If the resource partially cleared, the megawatts that didn’t clear can carry over to the next CCP. The project name and ID from the previous CCP will be retained when carrying over an SOI. Updates to carryover SOIs are permitted as long the SOI window is still open. For screenshots of the carryover process, see the “New Generation and Imports Show of Interest (SOI)” or “Demand Capacity Resources Show-of-Interest (SOI)” training. Both are available on the Training Materials webpage. Access the resource in the FCTS from the previous CCP screen. Select the SOI tab for the project in the previous CCP. Click the Carry Over Proposal button on the SOI screen. Once the new SOI is created, the participant must then access the new SOI screen and click the Update SOI button to update any necessary information. Go to the Proposal Summary screen. Most project sponsors are expected to complete more than one section of the package depending on the resource type. Intermittent generation resources seeking qualification need to provide additional information to support their claimed summer and winter qualified capacity as part of their NCQP. Intermittent generators are defined as wind, solar, run of river hydro, and other renewable resources that do not have control over their net power output. This additional information should contain site-specific data, as well as all calculations deriving the claimed capacity using resource data, equipment energy conversion efficiencies, etc. This information will be used to confirm the claimed summer and winter qualified capacity. Detailed data submittal guidelines for each type of intermittent resource are available on the FCM page. Critical path schedule (CPS)—The CPS must be provided indicating the milestones that will lead to the timely completion of the project by the start of the relevant capacity commitment period. These milestones are described in Market Rule 1, Section III.13.1.1.2.2.2, Critical Path Schedule. Offer floor price—The project sponsor must indicate its offer in $/megawatt. If wishing to submit an offer below the offer-review trigger price set by the ISO’s Internal Market Monitor (IMM), the project sponsor must provide supporting documentation. See below for details. Fuel survey—The project sponsor must submit the Fuel Inventory Survey for New Capacity Resources, which can be found on the FCM webpage. Additional requirements—For modifications to existing resources and intermittent resources, additional requirements are described in Market Rule 1, Section III.13.1.1.2.2.5, Additional Requirements for Resources Previously Counted As Capacity, and Section III.13.1.1.2.2.6, Additional Requirements for New Generating Capacity Resources that are Intermittent Power Resources and Intermittent Settlement-Only Resources. Cost data associated with the project must be in sufficient detail to allow the ISO to determine that the relevant cost threshold will be met. Environmental compliance projects must include a detailed description of the specific regulations the project is seeking to comply with and the permits it must obtain. Rules are located in Market Rule 1, Section III.13.1.1.2.2.2, Critical Path Schedule, to Section III.13.1.1.2.2.6, Additional Requirements for New Generating Capacity Resources that are Intermittent Power Resources and Intermittent Settlement-Only Resources. The Guideline for Submitting Cost Information for Resources Previously Counted as Capacity can be found here. As part of the new resource qualification process, a new generating resource will be subject to the initial interconnection analyses to ensure that (1) the new generating resource does not cause overloads that cannot be fixed in time for the capacity commitment period and that (2) its capacity is deliverable within the load zone into which it will be interconnecting. Existing resources seeking to qualify additional capacity will be studied at a capacity value above their current capacity network resource capability (CNRC). The assessment includes steady-state analysis, short-circuit analysis, thermal analysis, and other analyses depending on project type. Results from interconnection procedures for large and small generators and elective transmission upgrades (ETUs) are used whenever available. The transmission line between substation 1 and substation 2 (1–2) becomes overloaded when generator A is added. Generators that add to the loading of 1–2 are called harmer generation. 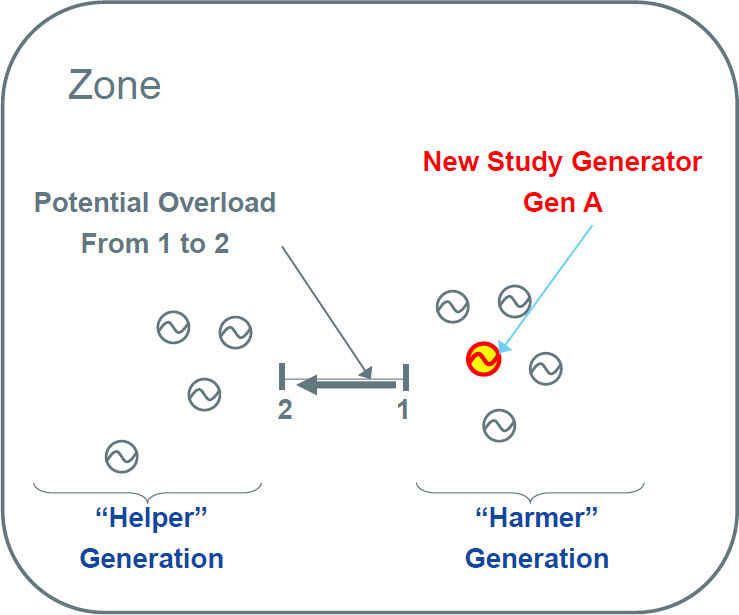 Generators that reduce the loading of 1–2 are called helper generation. Under the NCIS, other harmer generation can be redispatched down to relieve the overload. However, the combination of the new generator and redispatch must not degrade transfer or import capability, and the new generator may not be incrementally useful capacity (i.e., provide incremental capacity benefits on top of all existing generation). Under the CCIS, harmer generation may not be redispatched to relieve the constraint in an attempt to make the new generator incrementally useful. The analysis is performed as a group study. All projects in the ISO’s Interconnection Request Queue seeking capacity network resource or import interconnection service are included on the basis of their queue position. Generation redispatch is dependent on the distribution factor (DFAX) of the generators in the study subsystem. The DFAX is a measure of the change in electrical loading on an element such as a transmission line or transformer due to a change in output from a given generator. This distribution factor is computed by the power system software used for the analysis (e.g., PSSE and PowerGEM TARA). Harmer generation with a DFAX of ≥3% on a monitored element for a given contingency is not to be redispatched to relieve the constraint for a given study dispatch. Transfer levels from external control areas are modeled to reflect various conditions ranging from a 0 MW transfer up to the associated interface import capability. Internal transfer levels are modeled to reflect various conditions ranging from a 0 MW transfer up to the internal interface transfer capability. Generation under study is not required to upgrade interface transfer capability between load zones. The test is performed at 100% of the 90/10 summer peak load. Existing generation that has not permanently delisted or retired in a previous FCA is modeled at its CNRC. Existing demand capacity resources are included in the base case. All applicable criteria are considered for N-1 single-element and multiple-element contingencies, consistent with the North American Electric Reliability Corporation (NERC) TPL-001-4, Northeast Power Coordinating Council (NPCC) Directory 1, and ISO-NE Planning Procedure No. 3 (PP-3), Reliability Standards for the New England Area Pool Transmission Facilities. The post-contingency system is analyzed, if appropriate, to confirm that the system can be brought to a state prepared for the occurrence of a subsequent contingency (N-1-1) in the time required by, and using the actions allowed in, the applicable ISO New England planning procedures and operating procedures. 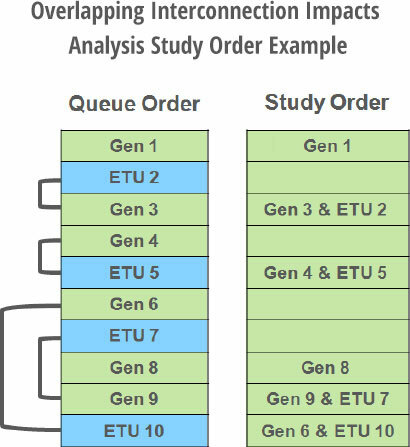 The overlapping impact analysis will reveal any qualification transmission upgrades (QTUs). These are transmission upgrades that the study resource will be responsible for addressing to make its capacity deliverable to the relevant load zone. A transfer above the maximum transfer capability of a modeled intrazonal stability or voltage-limited interface. A distribution factor of ≥3%. A megawatt impact on the transmission element of ≥3% of the applicable thermal rating of the element. Reference Section 5.8.1 of Planning Procedure No. 10 for additional information on QTU identification. Qualification is restricted by overlapping interconnection impacts (see Conditional Qualification below) when the upgrades identified for a new generator cannot be completed by the start of the CCP. QTUs associated with regional reliability needs will be paid for by the region. QTUs associated with generator interconnection findings will be paid for by the project sponsor. If applicable, the resource may be partially qualified up to the amount it can operate without creating the observed transmission violations. Conditional qualification provisions apply when a resource may not qualify as a result of overlapping interconnection impacts with another resource. In these cases, Interconnection Request Queue order is used to choose between the overlapping generators. A resource with lower queue priority (queue position X+n) is accepted for participation in the FCA with conditional qualification. The conditionally qualified resource may clear in the FCA if the resource with higher queue priority (queue position X) withdraws before or during the auction. See Market Rule 1, Section III.13.1.1.2.3(f) for additional information. 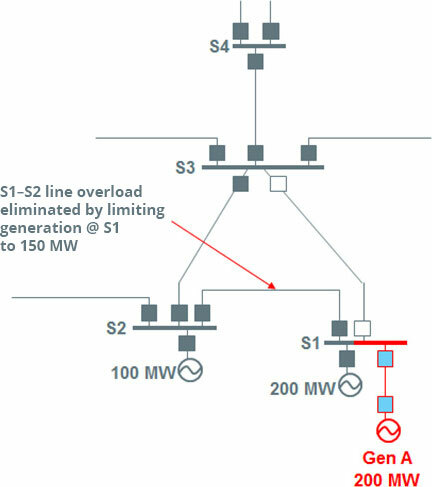 S1 has 200 MW of existing generation, but only 150 MW can run without upgrading the S1–S2 line. If upgrades cannot be made by the start of the CCP, new resource Gen A cannot qualify for the FCA. 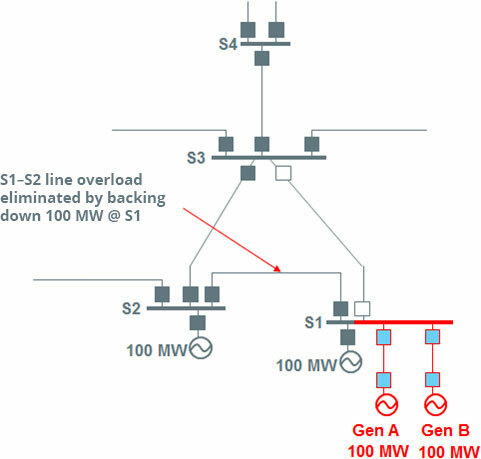 S1 has 300 MW of generation (including 100 MW of existing generation), but only 200 MW can run without upgrading the S1–S2 line. If the upgrade cannot be made by the start of the CCP, Gen A is qualified at 100 MW (provided that Gen A’s economic minimum is ≥100 MW). If the upgrade can be made by the start of the CCP, Gen A is qualified at 200 MW. 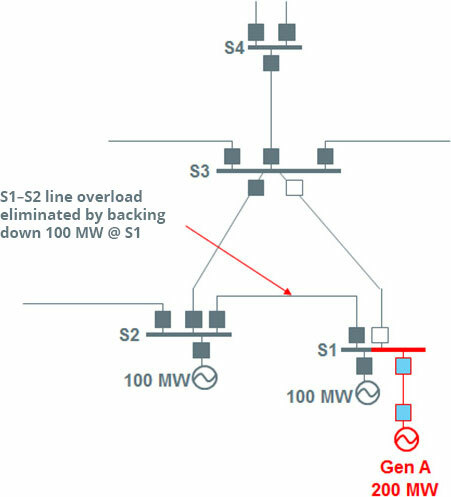 S1 has 300 MW of generation, but only 200 MW can run without upgrading the S1–S2 line, and the upgrade cannot be done by the start of the CCP. New resource Gen A has Interconnection Queue position 499, and new resource Gen B has Interconnection Queue position 500. Gen A is qualified at 100 MW. Gen B is conditionally qualified at 100 MW and will only be able to submit an offer in the FCA if Gen A does not submit an offer. Generator-based upgrades identified through these assessments will be listed in the qualification determination notification (QDN) of the resource, accessible in the Forward Capacity Tracking System (FCTS). If a new resource clears in the FCA, the overlapping impact would be restudied, and the final list of upgrades would become part of the critical path schedule (CPS) for the project. The progress of these upgrades, along with all other CPS milestones, will be monitored. Reference Section 5.8.3 of Planning Procedure No. 10 contains additional information on the methodology for restudying overlapping impacts. 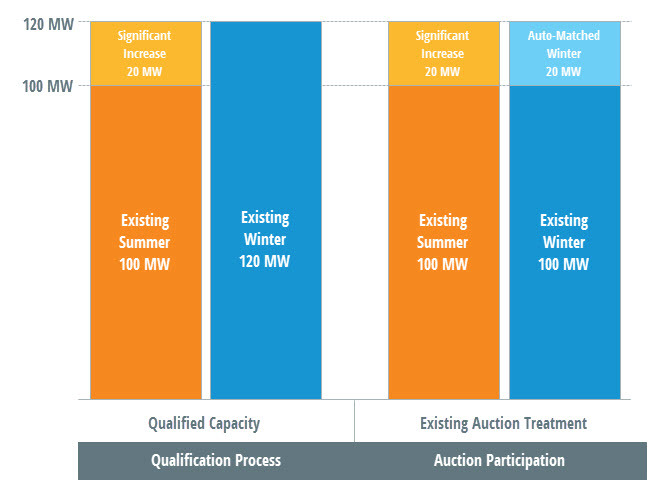 Project sponsors may elect to have the qualified capacity of their resource participate in primary auctions as a renewable technology resource (RTR). A designated amount of megawatts from RTRs are exempt from the minimum-offer floor price requirement in each capacity commitment period (CCP). The RTR election will be phased out with FCA #15 held in 2021. See RTR Phaseout below for details. To see how much capacity is available for RTRs for a specific CCP, see FCM Parameters. Learn about submitting an offer below the offer-review trigger price (ORTP). Note that renewable treatment elections will invalidate any prior election for a multiyear price lock-in for the resource. This election must be made no later than two business days after the ISO notifies the project sponsor about the qualification determination notification. The RTR election may not be modified or withdrawn after the deadline. Elections will also invalidate a prior multiyear election for the resource. Qualify as a renewable or alternative energy resource under a New England state’s mandated renewable or alternative energy portfolio standards (either by statute or regulation) as in effect on January 1, 2014. In states without a renewable or alternative energy portfolio standard, the resource qualifies under the state’s renewable energy goals as a renewable resource (either by statute or regulation) as in effect on January 1, 2014. For example, if the resource is participating in a specific state renewable or alternative energy program, the project sponsor must provide the name of the program, the web link for more information on that program, and detailed supporting documentation illustrating that the specific resource seeking qualification for RTR treatment has been accepted into that program and is (or will be) receiving revenue from the program. If the supporting documentation is applicable to multiple resources seeking RTR treatment, it must be uploaded for each resource separately, and the supporting documentation must clearly identify the resource by name, megawatts, or equivalent statements. Due to the tight timeframe for review, the ISO is unlikely to seek clarification on any documentation submitted. The election form is available in FCM Materials under FCM Forms and Guides. The RTR exemption will be phased out with the implementation of the substitution auction. The FCA associated with CCP 2024–2025 (FCA #15) will be the final auction in which the RTR exemption is allowed, unless the remaining available megawatts clear in a primary auction before FCA #15. Resources electing to participate in a primary auction as an RTR may also elect to participate in a substitution auction, provided that they meet all substitution auction supply eligibility criteria. Learn about the development of the substitution auction on the Competitive Auctions with Sponsored Policy Resources (CASPR) Key Project webpage. In certain instances, the ISO will automatically match an existing resource’s newly qualified additional megawatts with existing seasonal capacity at the same resource. Participants cannot opt out of automatic matching. The amount of capacity eligible to be automatically matched will be limited to the excess existing megawatts in the offsetting season (summer or winter) at the same resource. Any remaining seasonal incremental capacity will need to form a composite offer to participate in the FCA. An existing capacity resource submits a request to increase its capacity by 20 MW in the summer and 0 MW in the winter, and the increase is qualified as an incremental upgrade. The newly qualified summer megawatts are automatically matched to the excess existing winter capacity, and both the incremental capacity and the matched existing capacity are eligible for the multiyear price lock-in at the associated FCA clearing price. An existing capacity resource submits a significant increase in capacity for 20 MW of summer capacity and 0 MW of winter capacity. Both the significant increase in capacity and the base resource are qualified as existing capacity. The qualified summer significant-increase megawatts are automatically matched to the excess existing winter capacity at the same resource. An existing capacity resource submits an SOI to increase its capacity by 30 MW in the summer and 0 MW in the winter. The resource is qualified as an incremental upgrade and is eligible for the multiyear price lock-in. 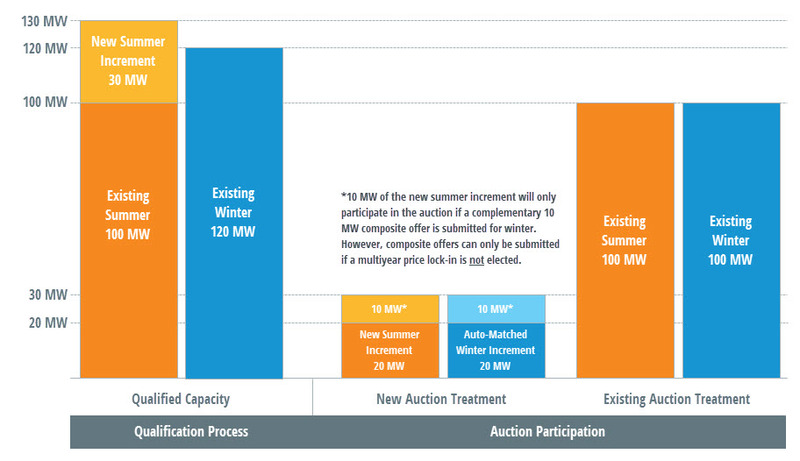 Only 20 MW of summer incremental increase are automatically matched to the excess existing winter capacity and eligible for the multiyear price lock-in at the associated FCA clearing price. 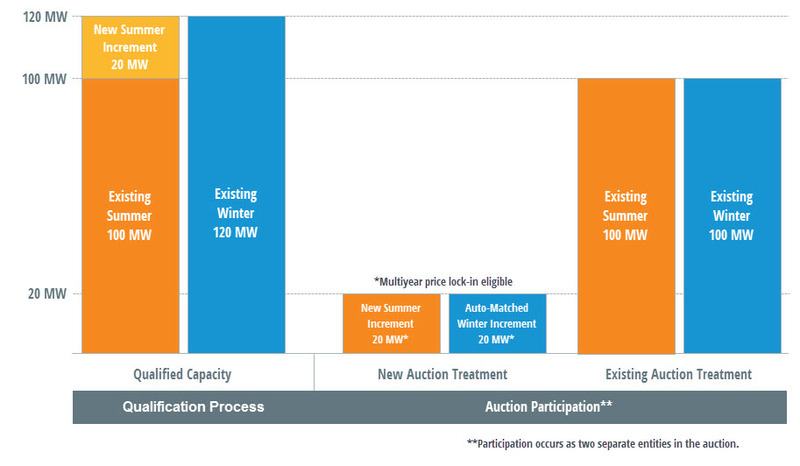 A composite offer will need to be submitted for the resource to bring the excess remaining (10 MW) to the auction. See Market Rule 1, Section III.13.1.1.1.3.A, Treatment of New Incremental Capacity and Existing Generating Capacity at the Same Generating Resource, and Section III.13.1.2.2.5, Adjustment for Certain Significant Increases in Capacity. Detailed information is available in the New Capacity Qualification for Supply Resources training available on the Training Materials webpage. An individual resource may also self-composite when that resource has an existing component and a new component. Note that in certain instances, the ISO will automatically match an existing resource’s newly qualified additional megawatts with existing seasonal capacity at the same resource.